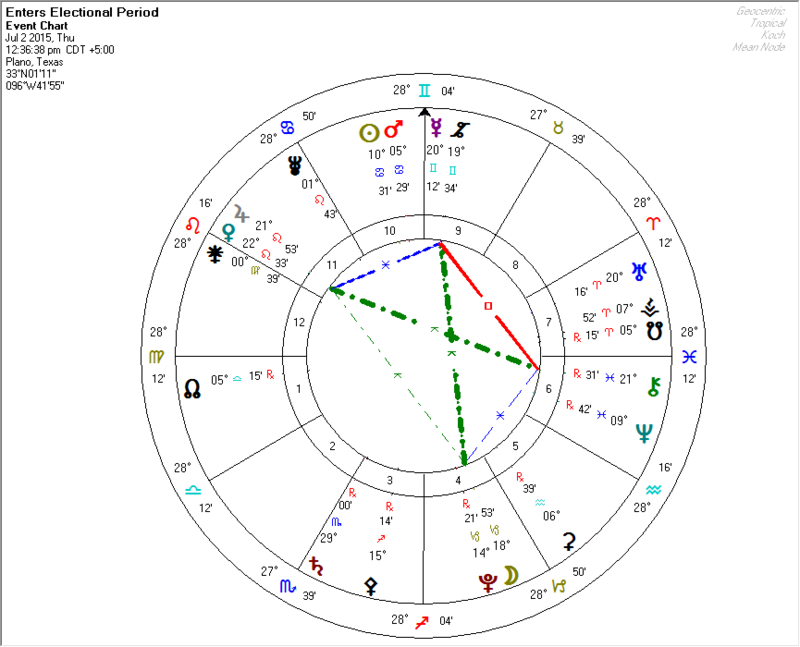 We are given some hints that issues involving healing or teaching (or both) are in play (Chiron), and major transformations that likely include power struggles (Pluto) are in play. We can benefit greatly, but we must act quickly and decisively. Astrology in July 2015 – Venus Conjunct Jupiter in the Setting Sky – TONIGHT! 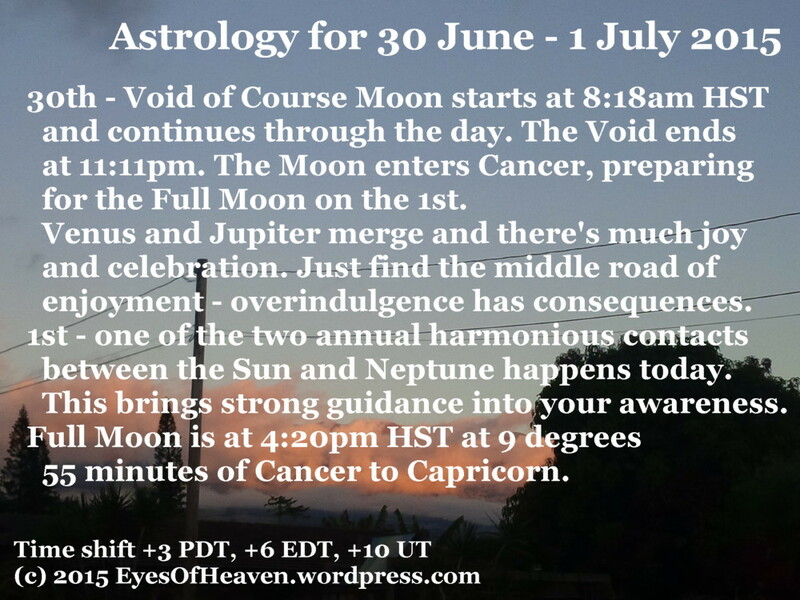 June 30, 2015 at 11:38 pm | Posted in Astrology | Comments Off on Astrology in July 2015 – Venus Conjunct Jupiter in the Setting Sky – TONIGHT! Jupiter and Venus will merge into a dazzling ”super-star” in the Western horizon by the end of June, NASA says.The conjunction of the two planets has been building during the month of June and will culminate in a spectacular display on June 30. “Every night in June, the separation between Venus and Jupiter will visibly shrink,” says NASA.A conjunction is when two or more objects appear very close together on the sky.On the evening of June 30, Venus and Jupiter will appear in the sky just a third of a degree apart. “That’s less than the diameter of a full Moon. You’ll be able to hide the pair not just behind the palm of your outstretched hand, but behind your little pinky finger,” NASA enthuses. Sky & Telescope suggests that a similar rare conjunction of Venus and Jupiter may have been what’s been called the ”Star of Bethlehem” in 3-2 BC. Reality As We Know It is suddenly, startlingly, drastically morphing to carry out the change imperative that has been mounting for the past three years. While shifts continue to erupt and propel us forward, the Capricorn Full Moon offers a status report filled with information about their impact on our emotions and sense of security. Stargazer Horoscopes July 6 – 12, 2015 – Kamloops Echo – from Sonny ! As the week opens you’ll find yourself in a reflective mood as old friends drop in to visit and recharge your emotional batteries. By mid-week you’re back in the swing and ready to get things going. You’re still in a creative mastermind cycle so keep the ideas flowing, especially around children. Double check joint finances. It was fun but too much time socializing has left you drained. Take some time to pamper yourself and generally slow down. Go to the spa or get your nails done. Taking care of yourself and your needs will lift your mood and prepare you for a weekend you’re going to remember. Here we are on the eve of the full moon in Capricorn of the year, as it is the norm in the month of July, when the Sun transits the sign of Cancer. All full Moons are completions. This earthy Capricorn Full Moon marks the half way point in 2015. We are half way through the year and need to take stock of what we’ve built till now and what, where, when and how we want to put our energies over the next six months when the Sun is at 9 degrees Capricorn, December 31st/ Jan 1st 2016. Capricorn, the 10th sign is earth, practical, Feminine and signifies career and the heights of worldly success. Capricorn is ruled by stern, disciplined, responsible, hard working planet Saturn, aka Father time, the karmic cop, limitations, obstacles, taxes, sexuality, maturity and death. The sign marks Winter Solstice in the North and summer’s beginning in the Southern Hemisphere.